Subway has set out an ambitious growth target of 35 new sandwich stores across Kent and Surrey in the next three years. It plans to grow from 92 outlets to over 125 by the end 2020; opening 15 stores this year and a further 20 over the following two years. The company says its franchisees currently employ over 900 people across the region and the new store openings will create a further 350 employment opportunities. Hemina Haque (pictured), the regional development agent, said: “I am really keen to hear from local people who are looking to fulfill their dreams of owning their own business and becoming their own boss. Franchisees benefit from operating in a tried and tested system, with excellent training and support provided. 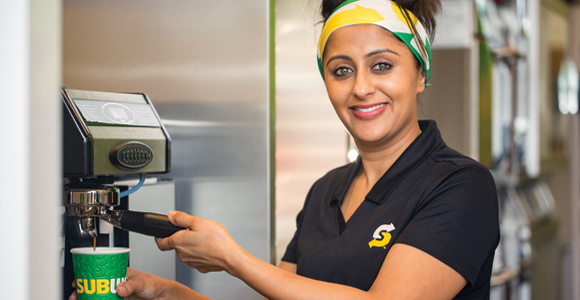 “Many of our franchisees start out with little or no experience in the food industry, but all posses a strong work ethic and a passion for the brand and its products. Seventy per cent of new stores established are by existing franchisees, demonstrating how rewarding it is. Subway unveiled a new Fresh Forward store décor last year, offering customers an enhanced brand experience with customer-focused touches, such as digital menu boards, free-to-use charging ports and special displays for its bread (baked in-store daily), cookies and vegetables. The first two Fresh Forward Subway stores have opened in Kent in Queenborough and Maidstone; with further new format stores scheduled as part of its regional development plans. Subway adds that it has further plans to increase its total number of stores across the UK and Ireland to 3,000 by 2020, creating employment for around 5,000 people.